This soldier’s beard may be gray, but he’s still a force to reckon with. Standing guard with his pike at the ready, he turns abruptly—the ribbon on his chinstrap is still fluttering with his movement—and gives us a wary glance. Dashing and heroic, he wears the orange sash and blue and orange plumes of the armies of the United Netherlands and their leader, the Prince of Orange. Despite the striking naturalism of this image, it’s probably not a portrait of a contemporary officer. Instead, this figure represents a “type” or historical personage, and similar images appear in instruction manuals for pike bearers. 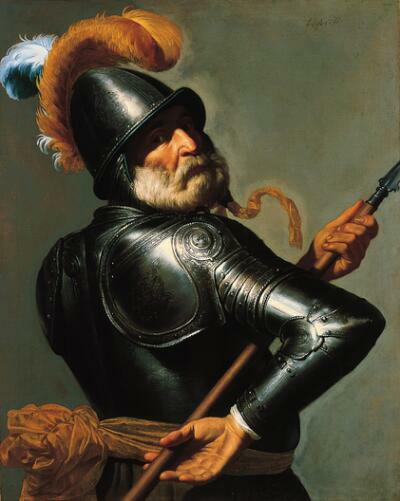 Painted around 1630, the artist Jan van Bylert, depicts a man in historic or military dress. No doubt, this figure refers to the Netherlands’ need for vigilance and military preparedness. The country’s arch enemy, Spain, was making overtures of peace – and many suspected that the Spanish were trying to lull the Dutch into a false sense of security.